If you’re anything like me, you need a no-fuss way to choosing keywords for pages and posts in WordPress because you’re too busy to obsess and your budget is too tight to hire someone to do it for you. If you have years of experience choosing keywords or you are super obsessed with SEO and it’s your only way of driving traffic to your website, this tutorial probably isn’t for you. But if you need a quick and efficient way of choosing keywords for SEO purposes and you use other methods of driving traffic to your website as well, then this video is a great guide to get you started. In previous videos, I showed you how to set up Yoast SEO to help drive traffic to your website and how to install Google Analytics and Search Console. If you missed those videos, I highly suggest you view those videos first as this video builds on the concepts presented in them. Please look below for links. 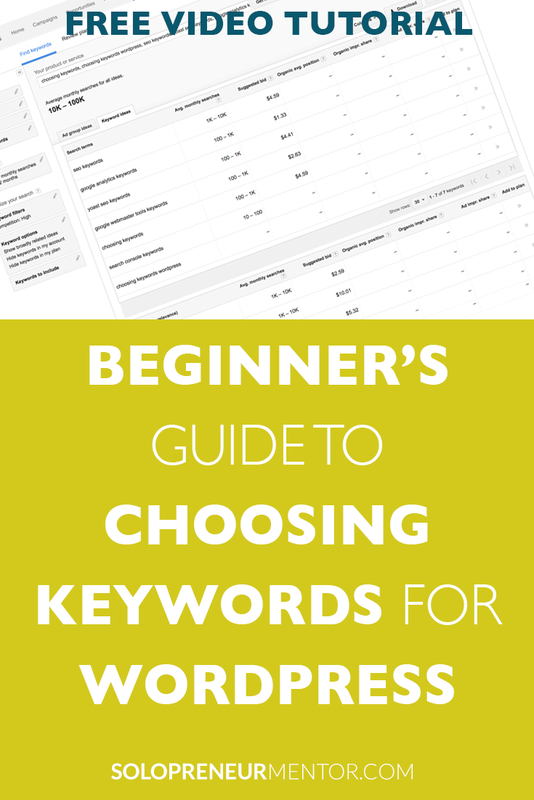 Now let’s get started choosing keywords for WordPress. In this video tutorial, I will cover the top SEO tricks you need to know. Next, I will show you how to sign up for Google Adwords using a free Google account so you can research keywords using the Keyword Planner Tool. I will also briefly show you how to use other keyword planner tools so you can choose the one you like the best. Finally, I will show you how to insert keywords into WordPress using the Yoast SEO plugin and built-in WordPress features. Sure – if you sign up for the newsletter, you will receive a link to the Behind-the-scenes Resources page and a password. In the Templates section, the first link is titled “Evernote Article Template”. That should be what you need! Enjoy!